It is with great sadness that the family of Emily Dillman announces that she passed away peacefully at the age of 90 on October 8, 2018 at Glenmore Lodge in Kelowna. Emily was predeceased by her husband Anthony (Tony) in 1967, her father John in 1982, mother Emilia in 1994, brother John in 2000 and son-in-law Dave in 2010. She is survived by her daughters Maureen (Michael), Jane (Roger), Patricia (Marty), Valerie (Ken) and fondly remembered by nine grandchildren, Steven (Jennifer), Nick (Kelly), Jeffrey (Suzanne), Amy (Josh), Joel, Selena, John, Melanie and Kaytlin. She also leaves five great granddaughters, Abigail, Cassandra, Willa, Harper and Violet, nieces, nephews and also cousins in Austria. She was a loving mother, grandmother and great grandmother and will always be missed and remembered forever. Emily was born in Kelowna in 1927 and married Tony in 1953. They operated an orchard on the Rutland bench, built a home and raised their family. She was a teacher in the Kelowna area and was well loved by her many students over the years. After Tony died she remained single, raising her family alone and teaching full time until she retired in 1987. She was a strong and independent woman, living in her own house until 2017. 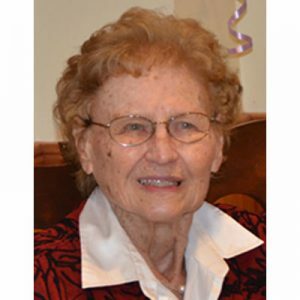 Emily enjoyed doing crossword puzzles, playing Scrabble, going on long walks and baking with the grandchildren. She was involved with the Heritage Classroom in Kelowna and the Educational Heritage Committee, helping to write a book about the history of Public Schools in the Okanagan. Emily canvassed for many years for both the Canadian Cancer Society and the Heart and Stroke Fund so, in lieu of flowers, please consider a donation to either of those charities. The family wishes to thank the staff at Glenmore Lodge for their wonderful care over the past year. A Celebration of Life will be held at Springfield Funeral Home, 2020 Springfield Road, Kelowna on Monday, October 22, 2018 at 10:00 am. Interment will follow at the Kelowna Memorial Park Cemetery. The service for DILLMAN, Emily (nee Hartman) is scheduled for Monday, October 22, 2018 at 10:00 am. Below you will find the map for the service location and the contact information should you have any questions. Aunt Emily was a very special person and I have found memories of going up to her house and playing with the kids and swimming in the pool. I also remember picking fruit in the orchard and fixing things that broke in the house with my dad Dan Bach. My most sincere condolences to the Dillman girls ( Maureen, Jane, Pat and Valerie for the very sad loss of your mama. I’ve been thinking about your mom everyday since learning of her passing, and each time I think of her my face lights up with a smile. She was a mom backup for me and a very important and cherished role model for me as a young woman growing up in the 70s. To this day I’ll never understand how she could stand having so many kids in her backyard and in the house year after year never losing her cool and supplying us all with all the food, and drinks we could ever want. My most fondest memories of my childhood are spending time with the Dillman family with Mrs Dillman. She played tennis and picked cherries with me and helped me to have some of the best memories of my childhood. Mrs. Dillman’s contributions throughout her life made a tremendous difference, all for the good, for so many people.